Time Frame: 3 hours or full day. Solving environmental challenges requires the best efforts of teams of people with diverse skills and perspectives. The Boreas integrative leadership workshop empowers participants with integrative leadership skills for making meaningful progress on tough problems. The workshop takes place over either a half-day or full day. This experience is not for spectators! Participants learn about leadership practices and then practice and apply them in an experiential, learning lab format. Participants sharpen their abilities to address common challenges in leading diverse groups working on wicked environmental problems, practice conflict management and polarity mapping tools for engaging in thorny environmental dilemmas, learn from examples of successful integrative leadership, and build networks among participants with differing perspectives and skills. What is integrative leadership, and why do we need to use it to solve society’s grand challenges? What are the unique contributions you bring to the collaborative table? How can individuals from different disciplinary backgrounds orient themselves to a problem? 1. Introduce the perspective that a vibrant network and community is essential for developing as a leader, having impact, and making progress in one’s career. Clarify the idea that being generous in these relationships is important for transformational work. Define integrative leadership and describe the characteristics of integrative leadership. 2. Describe the process of drawing one’s network and give participants the opportunity to practice. Discuss what it means to be a leader and articulate the skills leaders need to be good facilitators and hosts. 3. Provide an overview of thinking through mentoring relationships starting from the perspective of skills/capacity development and have students work through a structure process from this perspective. Facilitate conversation about this process. Understand grand challenges and recognize ways in which integrative leadership can strengthen approaches to solving these challenges. 4. Facilitate conversation about strategies for following up on connections and maintaining relationships. Have students write a thank you note. Through reflection, understand individual contributions to collaborations such as disciplinary background, personal strengths and skills, or sector background. 5. Build a community in the room and demonstrate the idea that everyone has something to give through sharing activity. Practice integrative leadership in the context of defining and solving a grand challenge. 6.Debrief workshop and ask students to commit to an action to work on their community/network/mentoring relationships. Reflect on and propose next steps for personal leadership development to strengthen integrative leadership skills. Why you’re interested in this session: What wicked problem most interests you? Group introductions fosters a sense of collaboration and gives us all a chance to see the variety of programs, disciplines, and sectors represented in the room. Learn what integrative leadership is and how it interacts with the type of work you want to do. This includes a brief academic background, discussion on leaders as hosts, and connection of cross-boundary work to solving grand challenges. Think about how your discipline defines the problem. Discuss in a group and learn how other disciplines define the problem and approach solutions. Build a group understanding of the problem, and recognize the contributions that each discipline can make to solve it. More time is spent building a group orientation to the problem instead of time spent on solutions. Slowing down to focus on the process illuminates approaches you can use in other group settings. Present to the group, take questions, and learn how work in one grand challenge area may help solve issues in other areas. Presentations foster networking and connection. What lessons did you learn? What are your next steps for developing as a leader? Dan Larkin (Fisheries, Wildlife and Conservation Biology & Minnesota Aquatic Invasive Species Research Center)Hear from University researchers who are currently working on grand challenges. Panelists share their views of collaboration and provide concrete examples of how principles of integrative leadership appear in collaborative work. Speaker: Jen Mein, MEd (Innovation Manager, Future Services Institute) Learn to think with a systems perspective. In what types of systems do we exist? How does the system influence problems and solutions? How can we, as leaders, use participatory processes to incorporate different perspectives? 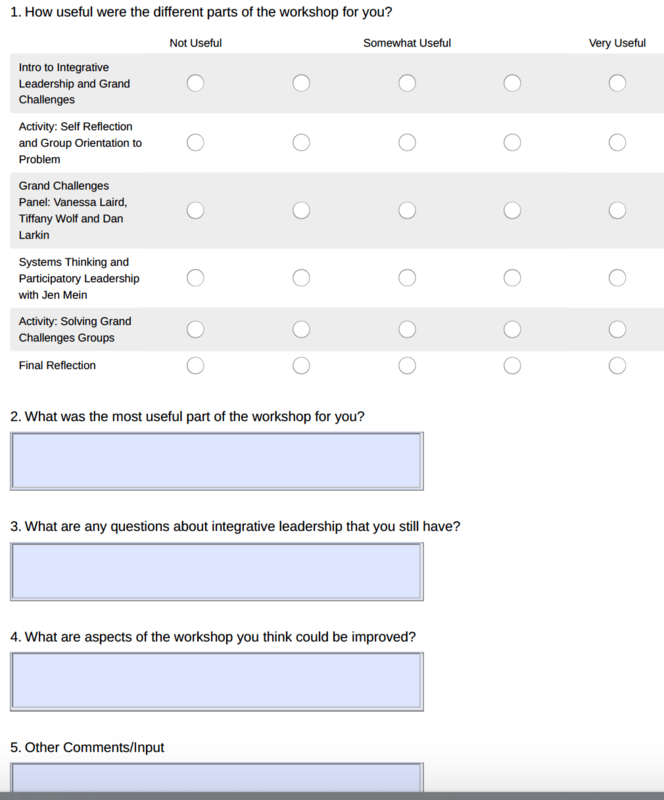 Thank you for signing up for the Integrative Leadership workshop. The workshop will take place in the [Learning and Environmental Sciences Building on the St. Paul campus] from [time-time] in [room] on [Date]. This experience is not for spectators! Participants learn about leadership practices and then practice and apply them in an experiential, learning lab format. Participants sharpen their abilities to address common challenges in leading diverse groups working on wicked environmental problems, practice conflict management and polarity mapping tools for engaging in thorny environmental dilemmas, learn from examples of successful integrative leadership, and build networks among participants with differing perspectives and skills. There is no pre-work required for this workshop. You will need a pen. If you do have 10 minutes to spare, we recommend watching this TED Talk, “The Power of Integrative Leadership” before the workshop. Thanks so much for attending today and a special thanks to Liz Sopdie and the Center for Integrative Leadership for putting together such a wonderful presentation today. Please fill out this survey to let us know about your experience and what worked well and what we can improve for next time. Also, if you are interested in our Leadership Certificate Program, networking events or the Speaking Science conference, please visit our webpage. Bryson, J., Quick, K., Slotterback, C., & Crosby, B. (2013). Designing public participation processes. Public Administration Review 73(1): 23-34. Quick, K. (forthcoming 2017). The narrative production of public engagement. Journal of Planning Education and Research. Sandfort, J. & Bloomberg, L. (2012). InCommons: Supporting community-based leadership. Community Development 43(1): 12-30. Barriero, T., & Stone, M. (2013). Social entrepreneurship: From issue to feasibility plan. NY: Business Expert Press. Marcus, A., & Anderson, M. (2006). A general dynamic capability: Does it propagate business and social competencies in the retail food industry. Journal of Management Studies. McDonnell, B. (2017). Benefit corporations and public markets: First experiments and next steps. Seattle University Law Review, 40(717). McDonnell, B. (2014). Committing to doing good and doing well: Fiduciary duty in benefit corporations. Fordham Journal of Corporate and Financial Law, 20(19). Bryson, J., Crosby, B., Stone, M., & Saunoi-Sandgren, E. & Mortensen, J. (2008). Collaboration in fighting traffic congestion: A study of Minnesota’s urban partnership agreement.” Final report prepared for Intelligent Transportation Systems Institute, Center for Transportation Studies. Bryson, J., Crosby, B., Stone, M., & Saunoi-Sandgren, E. (2009). Designing and managing cross-sector collaboration: A case study in reducing traffic congestion.” IBM Center for the Business of Government. Bryson, J., Crosby, B., & Stone, M. (2015). Designing and implementing cross-sector collaboration – Needed and challenging. Public Administration Review, 75(5), 647-663. Bryson, J., Crosby, B., Stone, M., & Saunoi-Sandgren, E. (2011). Dynamics of cross-sector collaboration: Minnesota’s urban partnership agreement from start to finish. Final report prepared for Intelligent Transportation Systems Institute, Center for Transportation Studies. Bryson, J., Crosby, B., & Stone, M. (2006). The design and implementation of cross-sector collaborations: Propositions from the literature. Public Administration Review, 66(Special Issue): 44-55. Crosby, B., & Bryson, J. (2010). Integrative leadership and the creation and maintenance of cross-sector collaboration. Leadership Quarterly, 21, 211-230. Crosby, B., & Bryson, J. (2012). A leadership framework for cross-sector collaboration. In Patricia W. Ingraham and Soonhee Kim, eds. Public Sector Human Resource Management. Thousand Oaks, CA: SAGE. Quick, K. (2011). Building ‘America’s greenest city’: Inter-sectoral leadership in Grand Rapids, Michigan.” Teaching Case for Integrative Leadership Seminar. Osofsky, H., Shadian, J., & Fechtelkotter, S. (2016). Arctic energy cooperation. UC Davis Law Review, 49(1431). Osofsky, H., Shadian, J., & Fechtelkotter, S. (2016). Preventing and responding to arctic offshore drilling disasters: The role of hybrid cooperation. The Role of International Environmental Law in Disaster Risk Reduction, 392. Osofsky, H., & Wiseman, H. (2014). Hybrid energy governance. University of Illinois Law Review 1. Bryson, J.,Ackermann, F., & Eden, C. (2014). Visual strategy: Strategy mapping for public and nonprofit organizations. Hoboken, NJ: John Wiley and Sons. Quick, K. (2015). Locating and building collective leadership and impact. Leadership. DOI: 10.1177/1742715015605348. Published online before print September 15, 2015. Sandfort, J., & Gerdes, K. (2016). The design, pedagogy and practice of an integrated public affairs leadership course. Teaching Public Administration. Bryson, J., & Crosby, B. (2013). Managing stakeholders in the change and innovation process. In Stephen Osborne and Louise Brown eds. Managing Public-Sector Innovation. London: Routledge, pp.118- 141. Fremeth, A., & Marcus, A. (2016). The role of governance systems and rules in wind energy development: Evidence from Minnesota and Texas. Business and Politics. Lundquist, L., Sandfort, J., Lopez, C., Odor, MS., Seashore, K., Mein, J., & Lowe, M. (eds.). (2013) Cultivating Change in the Academy: Practicing the Art of Hosting Conversations that Matter within the University of Minnesota. Sandfort, J., Stuber, N., & Quick, K. (2012). Practicing the art of hosting: Exploring what art of hosting and harvesting workshop participants understand and do. University of Minnesota’s Center for Integrative Leadership: Minneapolis, Minnesota. Jodi Sandfort is an Associate Professor at the Humphrey School of Public Affairs at the University of Minnesota and co-Academic Director of the Center for Integrative Leadership. In this 60-minute presentation, Adam Perlman, MD, MPH, Associate VP of Duke Health and Wellness and Program Director for the Leadership Program in Integrative Healthcare at Duke University, and Michael C. Aquilino, President & CEO Innovational Services, present key philosophies of Integrative Leadership and tools for developing effective leadership skills, building a mission-based culture and fostering better engagement and alignment in teams.